Tomorrow evening Preston and I will finally be on our way to sunny Southern California! We haven’t been on vacation since we were at Disney World back in January, which Preston doesn’t truly consider a vacation since that’s when he ran his first marathon. According to him, we haven’t been on vacation since last summer, when we spent six days in the Napa and Sonoma Valleys celebrating our first wedding anniversary. In front of Cinderella’s castle at Disney World back in January. 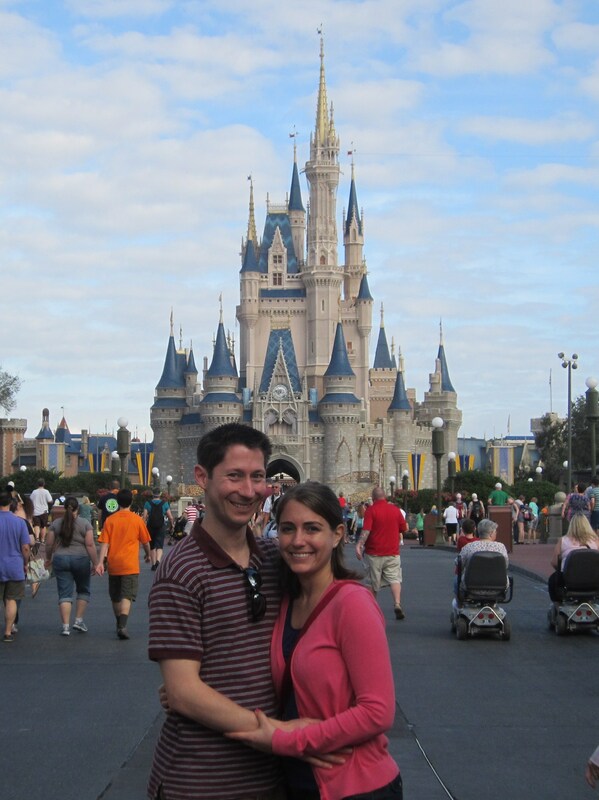 We can’t wait to take a similar picture in front of Sleeping Beauty’s castle at Disneyland! We have a lot planned during our two weeks there, including three days at Disneyland, two nights on Catalina Island, and visiting Preston’s best friend and his wife who recently moved to San Diego. I’m trying to be realistic about how much training I’ll get in while we’re gone, and its likely that I’ll probably be more enthusiastic about it at the beginning of our trip than at the end. In order to ensure that we run at least once during the second half of our trip we’ve signed up for the Balboa Park Three Miler in San Diego next Saturday morning. Because we’ll be on vacation, I’m not setting any high goals for myself for this race other than to have fun and enjoy running in non-DC summer weather. This will be my first trip to Disneyland! I finally get to see where Preston grew up and lived until his family moved to New Jersey when he was 13. San Diego has been on my travel bucket list for quite some time and I can’t wait to enjoy this gorgeous city with some of our closest friends. At this point, all that stands between us and California is packing, my last day of curriculum development for this summer, and a half day of work for Preston. I’m not sure how much time I’ll have for writing while we’re out there, but I can’t wait to share the highlights of our trip once we’re back! 1 Response to California, Here We Come! Have a great trip! I guess you won’t be able to crash the Crystal City Twilighter with me! I’ll let you know how it goes!